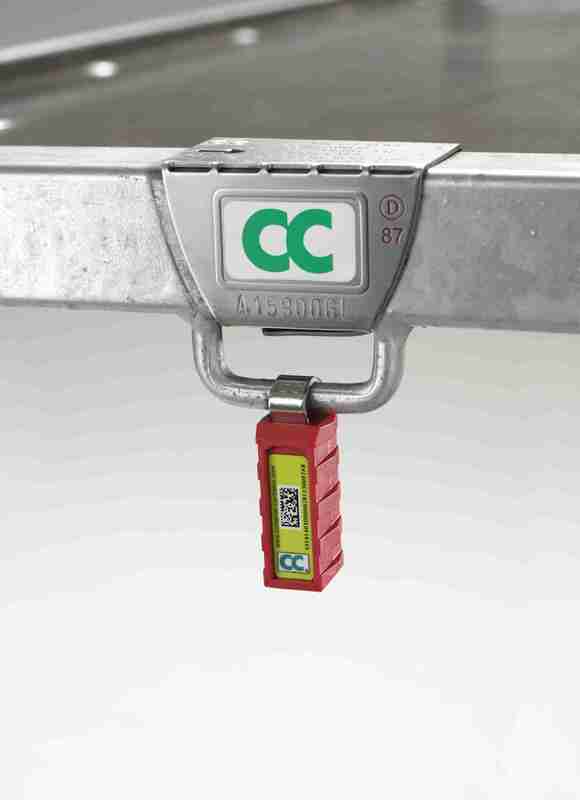 During the past months, there have been numerous reports about the new ID tag with built-in RFID (‘electronic labelling’) for the CC Containers. Now the design of the tag has been released by Container Centralen (CC). All CC Containers must have this new tag and the CC metal plate to be accepted in the CC Pool System from January 10, 2011. The new ID tag for the CC Containers is easily recognisable. The red colour makes a fast visual check possible, and when scanning the built-in RFID, the user can establish if the container has a genuine CC RFID tag. With the increased protection of the CC Container pool, fake low-quality containers will be kept out in future, which will mean lower costs for repair and maintenance as well as the elimination of free riders in the system. CC have committed themselves to pass on all cost savings to the customers. Thus, there will be no pool fee price increase in 2011, and it will even be reduced by at least € 0.50 in 2012 and another € 0.50 in 2013. CC has contracted an external partner to pack and ship the 3.5 million RFID tags required for the project. About 20,000 companies have CC Containers under contract and they will receive the quantity of tags corresponding to the quantity stated in their contracts before January 10. 1. From the 10th of January 2011, FloraHolland, GASA Group, Landgard and CC will scan all ingoing containers. 2. From the 10th of January 2011, FloraHolland, GASA Group, Landgard and CC will only hand out genuine CC Containers. 3. In December 2010 / January 2011 customers will receive new ID tags (‘padlocks’) according to the number of CC Containers they have under contract with CC. CC will credit the customers € 0.20 per CC Container for the tagging. 4. If the customer has more CC Containers than stated in his contract(s) with CC, he can currently add these to his CC contracts at a special license fee of only € 6 per CC Container. After the 10th of January 2011, the license fee will be € 18. 5. All containers without the new CC ID tag and the CC metal plate will be rejected. 6. New ID tags that cannot be scanned or give an error message will, in the first instance, also be accepted and included in the customer’s balance. The containers will, however, be recorded separately. 7. A special Control Group, manned with both CC and external experts, will investigate and report any suspicious flows or patterns. This is necessary in order to find and eliminate misuse of the shared system. 8. If the situation demands it, customers with suspicious flows or patterns will be asked to improve control before hand-in so that any misuse can be avoided. 9. Containers without a genuine CC RFID tag are not accepted in the CC Pool System. Therefore, CC recommends that you always scan the containers you receive.